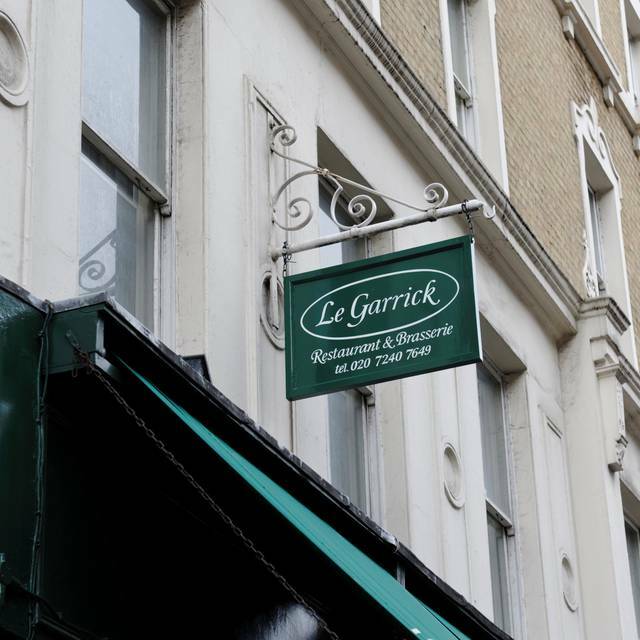 You must make bookings at least 5 minutes in advance of the time at Le Garrick - Covent Garden. Covent Garden, Leicester square and Trafalgar square station. Every party is different and adapted to your needs. From buffet to table service, open bar to cash bar. kids area with nanny on request, dj, music band. Having Le Garrick to you and your guest is quiet a feeling when you are downstairs. Check the album craigs birthday, It'll speak for itself. 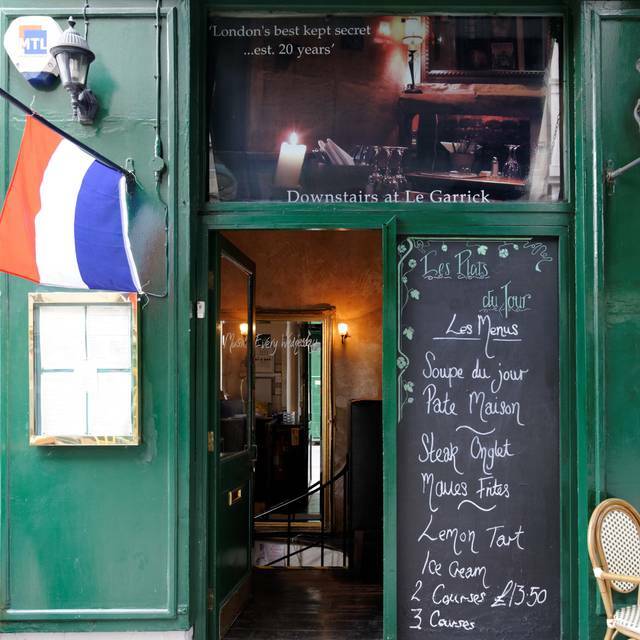 Le Garrick Restaurant located in the middle of London's theatreland is an intimate French restaurant that's a favourite with theatrical types, business people and lovers of French cuisine. There is a homely restaurant at ground level, while at lower ground level the friendly bar/dining room has intimate nooks for romantic moments. 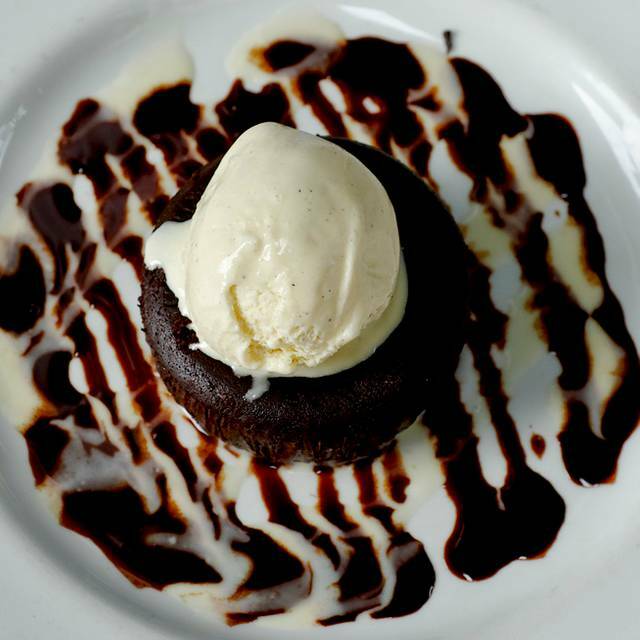 Le Garrick's menu features classics and favourites of French bistro cooking, dishes like grilled entrecote with sauce poivre and pommes frites or lemon tarte with creme fraiche among the classic desserts. The two course prix fixe menu is a lifesaver pre-theatre. The entirely French wine list offers wines by the carafe as well as the bottle and glass. 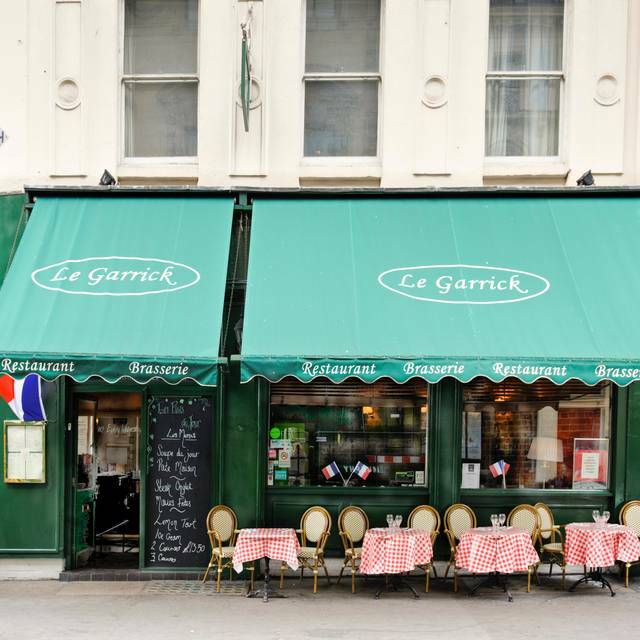 In an area that's chock-a-block with chain eateries, Le Garrick is a one-off. Excellent value pre theatre menu at£13.95 for 2 courses and handy for a number of theatres. The food was excellent and very good value (we had the pre-theatre fixed menu). The service was also excellent. I would definitely recommend, and will be visiting again. Thank you. I love this place. Can't wait to go back (again and again and again)!! Always lovely. It’s our go-to restaurant for catch ups. Good good, great atmosphere and fantastic friendly staff. Love this place. It was our first visit. 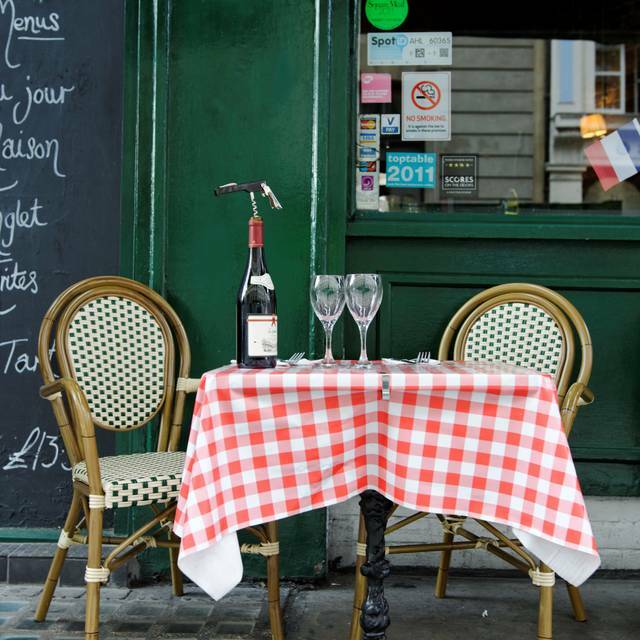 I felt as if I had been transported to a little local Parisian bistro. The prie fixe menu is excellent value- my husband’s steak onglet was perfectly cooked. The staff are charming (and French!). Perfectly located for the theatre and Trafalgar Square museums. We will definitely go back! 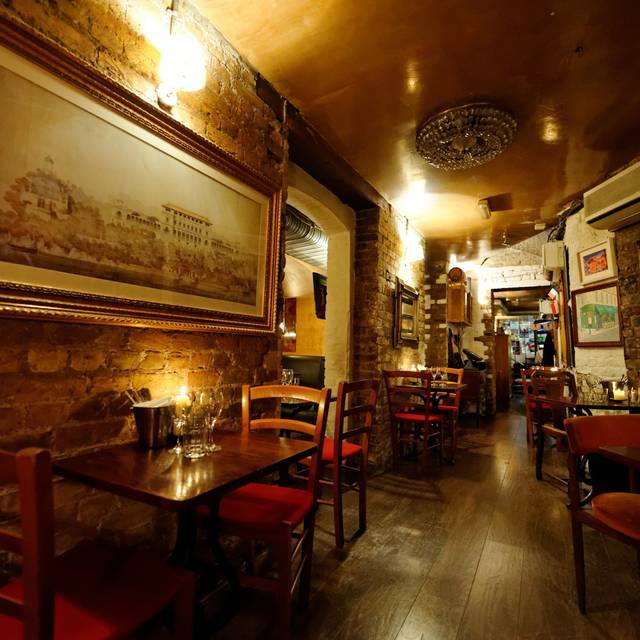 Le Garrick is located on both street level and in the basement and it is cosy. They have a good selection of entrees and main courses with matching range of wines. We started with the charcuterie and then had the coquelot and boeuf bourguignon, both of which were delicious. Le Garrick is very convenient for theatre-goers between Leicester Square (2 minutes) and Covent Garden, so I thought the prices are reasonable. We will be back. Charming venue downstairs but food a bit disappointing, indifferent pate with tough bread but a fine steak, excellent house wine. We had a very good time at le Garrick, the atmosphere was cosy and romantic, the food was amazing from starters (we recommend to order some bread and butter) to desserts (very good the creme brulee and the mixed berry cheesecake) We also particularly liked the marinated beef and mussels marinières. The wine was good too. The waiters were nice and friendly, they even offered us some cointreau and madeleines since we were celebrating my boyfriend's birthday. I would only suggest to add a few more vegetarian options to the menu. And yes I would definitely recommend this restaurant! I'm sure we'll come back again. Two of us booked Le Garrick for a mid-afternoon late lunch on a Friday after a visit to the National Gallery a short walk away. We based the choice of restaurant on some good reviews and these were accurate - we had a similarly very pleasant experience. First I have to report that our service was excellent - friendly and chatty but not too intrusive. That makes a huge difference. 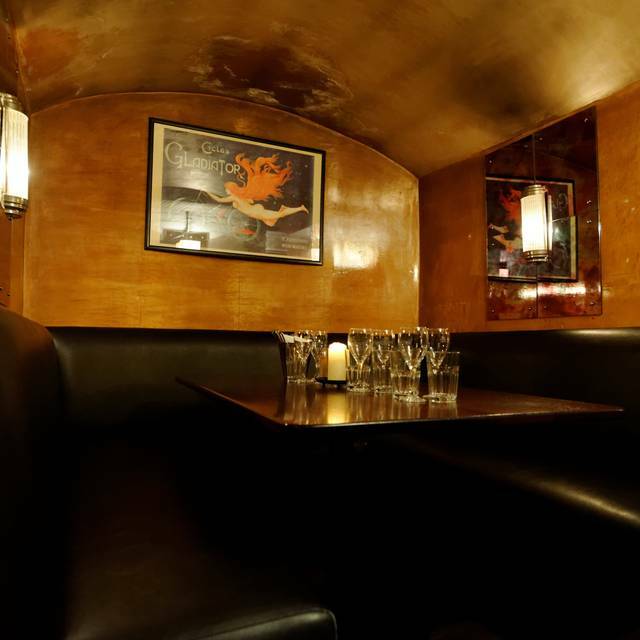 We chose a table in the basement and you could easily have imagined yourself in the basement of an intimate old Paris restaurant. Even when it got busier later the noise level was never intrusive. This is a French restaurant and the menu is French - I had the cassolette de calamars to start and the cassoulet de Toulouse for a main and they were both very good. The squid for example was tender (ie not overcooked). My dining partner had the generous charcuterie to start and filet du saumon et sa ratatouille for main which she reported was very good too. For dessert my partner had creme brûlée but I was seduced by the lady manager's recommended special - redcurrant cheesecake. This was a good recommendation - it was superb and the manager was delighted I had enjoyed it. With a bottle of a nice French merlot and tea/coffee to finish this was a perfect way to spend a relaxed afternoon. The price at a little over £100 for two including service is reasonable for Central London. In summary there is a lot to like about Le Garrick and I would suggest it beats sitting in some noisy large overpriced establishment, for example in nearby Covent Garden, hands down. Our first visit before the theatre and we will certainly go back. The service was excellent, friendly and efficient and the pre theatre menu was good value and tasty. If you like lots of space and light this is not for you but we enjoyed it very much. Love this restaurant. It has a really good pre-theatre menu, cheap and pretty good. I haven’t had anything from the other menu. Staff are always friendly and food comes out quick. Two two courses with extra deserts, coffee and champagne with tip (over the 12%) was £80 -£40 per head. Pretty good for London and super close for theatre, shops and bars. My dinner date was very late for a pre theatre meal. The staff were extremely understanding as I sat there and waited for him, they made sure I had what I needed. I think they thought I'd been stood up! When he arrived the food arrived extremely quickly and was excellent. I couldn't have asked for more from them. A very nice lunch with an old friend before going to a matinee—a perfect way to spend an afternoon, and Le Garrick is the perfect place to start. Had a lovely lunch with authentic French Cuisine. Service could not have been better. Good tasty food which was reasonably priced but they ran out of gas after a busy week but it shouldn’t have been a surprise that Saturday night was going to be busy. We were well looked after and given a free pudding and liquor shot so made to feel like we were compensated for a limited menu choice. Nice little restaurant, waitresses were very attentive. Informed on arrival that due to chef issues some of the choices were off the menu. We were then asked whether we wanted to go elsewhere which I thought was a nice touch. There was still plenty of choices. Meals were lovely, and turned up without delay, and there was a good vibe around the place. Would recommend and will go back. Charming greeting on arrival, with apologies for some items not being on the menu due to a problem with the gas. However, there was plenty to choose from, and our food was delicious. Excellent food, friendly staff. Would go again. Always friendly staff and delicious food at a reasonable price. Charming restaurant but I had the chicken over cooked dry with broken bone fragments. Would not go back. We had booked through Open Table but it was clear the server took no interest in that. As a result we received an email after accusing us of not turning up. Service was slightly random - at times rushed and at other times slow. Good quality was good and it was pretty good value for money. Chips were still frozen on one dish our party ordered. Service slow - 40 minutes for starter to arrive. Our kirs barely tasted of blackcurrant. On the plus side the pre-thratre menu is fairly good value. Warm and friendly welcome, good choice on the menu, very relaxed atmosphere and the food was amazing as usual. My go-to place for business lunch and casual dining. Our first visit and we sat upstairs. The tables are small and it is quite cramped - but a very pleasant atmosphere and friendly service. My daughter had a mountainous bowl of moules which she somehow finished and I had the Fish of the Day - Sea Bream - and very good it was. The sweets of Tarte au Citron and Creme Brulee were good if unexciting. The Macon Charnay was deemed exceptional by my daughter whilst I enjoyed the Pinot Noir. We were delighted by our meal and will visit again. We felt that the food was just churned out without a quality check, the wine and prosecco were not cold, and the value for money on the pre-theatre menu wasn't good, for what the food turned out to be. It really didn't feel anything like the reviews we had read. The noise levels were incredible . 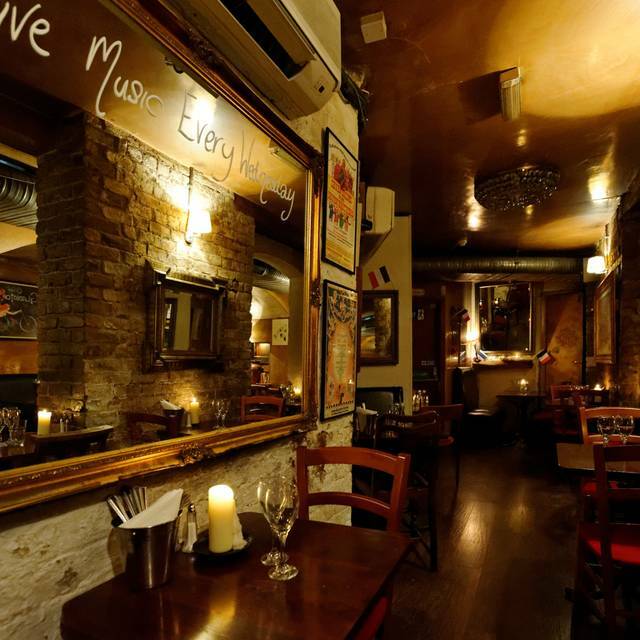 Cosy, authentic french with perfect pre theatre set menu at fantastic price. The team here are always charming, warm and friendly and food always good quality. Classic moules and steak frites recommended. I have been to Le Garrick in the past and I am very pleased to say that it is still as good as I remembered it. It is a lovely French restaurant. Very popular spot which is clealry down to the great food and wonderful staff. Had a great experience and would visit again. Our party of 4 all chose the restricted butgood value for money pre theatre dinner. We were downstairs, which is not spacious but has a good ambiance. The service was outstanding - very friendly and efficient adding to our enjoyment. We intend to return when we are not in a hurry for the theatre to try the a la carte menu. Fantastic venue, really friendly staff but the food really wasn't great. Sorry. 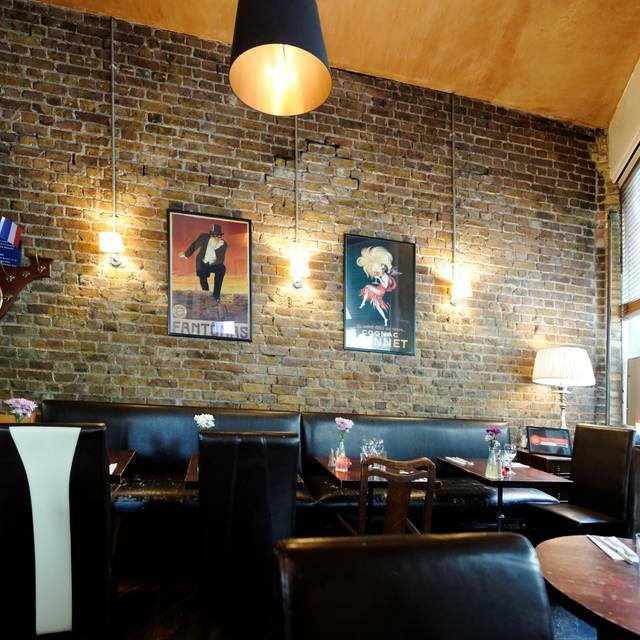 Try la petite auberge in Islington. Step change in quality. Le Garrick has been around for 32 years and we've regularly dined there for about 30 of those and so it's no surprise that we happily recommend it. The food is always consistently good and authentic. In recent months staff changes have been noticed but now staffing seems to have settled down and some of our favourite waiters have returned. On this occasion we were vey well looked after and enjoyed the evening. The boeuf bourginon washed down with pinot noir was delicious. Eaten here twice now, both times amazing. It is so good i would probably be happy paying full price, but if you can get there in time to take advantage of the pre-theatre menu, it is just fantastic value. You need to book as it got very busy around 6.00 p.m.. excellent cocktails (choice of two) and the house red is lovely. Service friendly and efficient, little things appreciated like keeping your water jug/(bottle) topped up. All round winner.